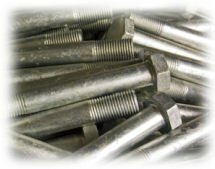 K-T Bolt has its own in house Hot Dip Galvanizing facility. Our Galvanizing process produces a coating which is bonded metallurgical to the steel. No other coating process has this feature and as a result galvanized steel has by far the greatest resistance to mechanical damage during handling, storage, transport and erection - an important factor where steelwork is to be shipped across the world. Well-documented years of experience have improved the benefits of hot dip galvanizing protection. at least 20 to 40 years are commonplace in industrial and marine environments, 50 - 100 years in less aggressive atmospheres.